So today I wanted to talk about Pareto's Principle or the 20/80 rule as it is known often as. This is a concept that can help guide your work - be it in game development or any other area. It was developed by Vilfredo Pareto - an economist, but it's application goes further than just economics. Look at it as - a concentrated approach to 20% key elements will yield 80% of the results; and vice versa, 80% of the elements will yield a measly 20% of the results. You can apply it in various forms. 20% of customers yield 80% of your revenue. 20% of bugs in your software cause 80% of the crashes and frustrations. 20% of the content in your game will yield 80% of the enjoyment customers will likely talk about and love. Now this isn't to say it's completely accurate and you should ignore 80% of the rest of whatever your doing, but making sure you focus on the more prioritised 20% can mean the difference when you are limited by time, budget and energy. A couple of weeks ago we spoke on the concept of concentrating your focus - this builds upon that. Instead of focusing on the 80% of things that will likely achieve very little in your goals - it is better to focus more intently on the 20% of things that will likely achieve the majority of your goals. I'm sure there are ways to determine what you could quantitatively say what 20% refers to in actual metrics but I think the true value to gain from this is more about understanding that some things need higher precedence over others. I'm sure you can apply this to most if not all situations given enough understanding of it - even in your personal life. I find that 20% of my day often yields 80% of the results I wanted to achieve on that day - in like studying, practicing, thinking and so on. At university - after 3 years, a portion of the things I am taught are infinitely more valuable to me personally than the other majority. This isn't because what they teach us isn't useful or valuable - but I can apply this principle and understand what elements are extremely useful to me and which aren't. I think this principle can be very useful - especially when things seem to be overwhelming. You can use this to try to nail down to the real priorities and relax a bit. You can concentrate your effort, time and money into the work that can yield the highest possible outcome. Needless to say - identifying what is the 20% and what is the 80% takes practice - but with time and patience, it's not impossible to grasp. If you think this doesn't work very well for you - than you can simply try something else. After all the beautiful part of experimentation in these areas is seeing what works wonders for you and what doesn't - so you can more effectively achieve what you want to achieve! So as you may know from my previous post, this month I've been working on my programming. I am on track with that - on the side however, I also began scribbling and thinking of a new idea for a side project. It is a board game that takes inspiration from games such as Dungeons and Dragons - however it takes a more simple approach to it's game play. 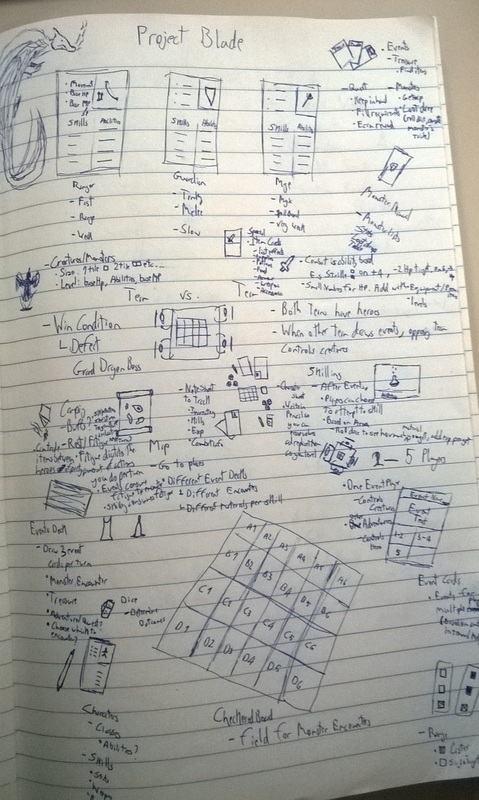 I began doodling ideas and scribbling notes whilst I was playing, reading and looking at videos - what started off as a small little sketch or doodle grew into a small project. I wanted the adventure you would find in an RPG - in board game form to play with a few friends of mine when they are over. At the same time I wanted a competitive element - inspired by a few of our magic the gathering games. I wanted to keep it simple - so that way we can jump in and have a fun time. At the same time I wanted to make sure that if we wanted to get someone new to join in - they don't have to go through learning a large amount of material only to discover the game isn't for them. I wanted it to be simple, fun and offer an RPG-like experience that can be as short - or as long as the players playing want it to be. With that in mind - I continued doodling and coming up with ways to do this. I am well on the way to testing out the first iteration of the game I nicknamed Project Blade for the sake of me just saying "my board game project" - very original right? So what I did to decide on how simple or complicated the game should be - I tried to make sure that everything about the game has to fit on a single page. At the very least for the major components of the game. This seemed to work out well - on paper. Scribbling and such helped me visualise how the game might tie together and how the various mechanics would interact. I have a number of other sheets that describe the actual content of the game; creatures, abilities, weapons and so on. I will describe the game later on once I have gone through a few iteration cycles to see what works, what doesn't, what needs to be adjusted and what seems to work very well. I look forward to bringing you more on this down the line! So this topic may sound familiar to those of you who already know a fair amount of business elements - whether from studying or so on. Those of you studying Game Design likely have heard something similar as well - it is part of the reason as to why many indie developers succeed now a days. This goes by many names, be it segmentation for business or in game design it often involves picking a mechanic - and doing it very well. In essence - both these boil down to your focus. Aside from ensuring that your game [or product] is something you not only believe in and are passionate about - you should ensure you focus your attention carefully. In game development - there is always the issue of balance between performance, art, and many other aspects that are all interlinked and depend on each other. Next generation graphics? Slow or weaker game play. Amazing gameplay? Often graphics need to sacrifice some ground. This isn't because of talent (All be it optimisation is a skill in itself) but at some point you need to realise that hardware up to now can handle so much. This is more particular if you aim to gather a larger audience. This applies to a general business side - think less resource based [Although resources play a huge part as to why you want to focus your product's specifications to a particular market's needs] and notice that you cannot - or should not attempt to please everyone. Same applies to game development - a strategy game is not the same as a FPS game. Moreover, an RTS game is not the same as a Turn-based strategy game. This is because the game play is different and more often than not the audiences that play these games play them for different reasons. The game play experience is not the same - and this counts for all the elements of the game such as art and story. You might say then what should I be focusing on if everything counts towards this idea of targeting a 'niche' [A niche is a small segment of a market that share a number of characteristics that are relevant to your product]? Well that's completely up to you. Games are an art form - you have music, sounds, visual and literature and finally interaction which helps define games for me. Interaction being the element that defines games over other art forms for me. Many triple A publishers prefer to keep towards what they know works, games like Call of Duty and Fifa don't change much because the goal of the publisher isn't to innovate. Money is all well and good - but you as a designer, more so as an entrepreneur likely seek more than just money, I would hope at any rate. Don't be discouraged just because a large chunk of people don't want to play your game or buy your product; take any construct criticism but remember you need to keep in mind what your trying to achieve. Otherwise your just trying to please everyone. You can apply this to practically any product or element in your life - be it music, game design, business, painting and so on. Focusing allows you to as the term says it, funnel your effort and resources towards whatever vision you have in mind, it also helps to keep you on track when criticism comes in. I hope this gave you an idea of what focusing your attention towards a particular direction can help you achieve. It is all well and good if you want to create a large project that tries to capture a lot of mechanics and themes - but are you sure it's what you want to do ? Keep in mind the workload and resources - and ultimately if your planning on making the product for a market, what the market requires and wants. Steve Jobs said it best - people don't know what they want until you show it to them. But I hope you played enough games to realise when too much is too much - and this goes to everything, be it complexity, flashy effects and just general precision. Understand what your trying to achieve and push for that - if your game is meant to be complex, go for it just make sure you believe in it and are ready to work to get it done. I hope you've had a great first month of 2016, examinations are finally over and I can now return to the normal post schedule on Tuesdays! I've decided to try out a new approach towards my planning of the year. Each month I will be allocating 5 items to complete by the end of the month. The items will be set in priority - so the first must be complete, once done I will move on to the second and so on. For February I will be focusing more on coding. In particular - Java coding and possibly try a hand at HTML5 coding at some points. In the mean time - I will be continuing to practice pixel art and such so you can expect some progress posts on those areas. I have also bought a fair amount of books during Christmas which I look forward to reading through during the year and I will be sure to give you my views on them as I get through them - so you can see whether they are something that may or may not interest you! That will be all for today - I will see you all next week!